We’ve all been led to believe that saturated fats are bad for us and we should always avoid them because they can cause heart disease, right? We’re all told as we grew up, that we should be careful not to eat too much fat and we should eat carbs, and other “healthier” alternatives. However, a study conducted by Harvard is telling a different story. They went out and dug through 1,600 scientific studies to see what they could find. They reviewed all of the research and separated the consumption of processed meats vs non processed meats. The processed meats included hot dogs, deli meats, cured bacon, and sausage, which concluded that when consumed daily can increase your risk of heart disease by 41%. Processed meats went through processes such as curing, salting, smoking, or the addition of preservatives. If eaten only once a week, the risk associated is minimal. Now for the good news. Eating unprocessed meats including beef, pork, lamb, or uncured bacon had no effect, and no increase in heart disease risk. The same amount of fat and cholesterol was consistent on both types of meats. However, the big difference that makes unprocessed meats healthier than processed meats is that they do NOT contain salt and chemical preservatives. Finding unprocessed meats can be tricky. I have a few tips for you to follow that can help you stay on track and help you choose the healthy meats that are actually good for you. Be a label reader. Read the ingredients list on the package to make sure that you know exactly what you’re getting. This is a critical component to buying the right meat. I recommend you forget about the nutrition facts because when you’re eating healthy they’re not very useful for you because you’re eating real food, not junk. Always read the ingredients to make sure there are no additives that could hurt your health such as sodium nitrates, added sodium, or sugar. Buy organic when possible. This will help eliminate the consumption of growth hormones, antibiotics, and steroids that food companies inject into the animals so they produce more meat. Additionally many of these animals are sick and have diseases in some cases.Non organic animals are fed grains, soy, and corn. This means that there is a very high chance that the food being eaten by these animals is genetically modified, since 70% of soy, wheat, and corn produced in the united states is Genetically Modified. The other 30% is organic or grown from non genetically modified seed. Eating an unnatural diet of grains means these animals have a lot of inflammation, which translates to having a high omega-6 to omega-3 ratios that get passed on to us as humans. Choose the uncured version. This can help especially when buying bacon. I was at the grocery store the other day and I saw bacon for sale and wanted to grab it because I rarely see an organic bacon package on the shelf. I then read the label which said uncured and contained no sodium nitrates. These were great benefits to read but when I read the ingredients I saw that the bacon had added brown sugar, and other ingredients that told me that this bacon is processed. 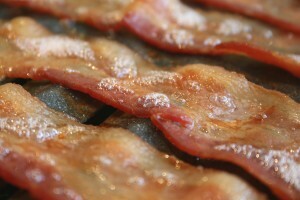 The best bacon to buy is 100% organic bacon with nothing else added to maintain your health. Remember, organic is fed a natural diet meaning the animal eats grass or food from it’s natural habitat. What labels or questions do you have about organic meats? Do you typically but organic or non-organic meats? Let me know in the comments section below.